There is always something interesting to see at a Yellow Springs Community Dance Concert. This is no dance recital! Hang onto to your seat and watch dancers and choreographers from 5 to 50+ years spin, fly, slide, slap the floor, and jiggle coined hips. 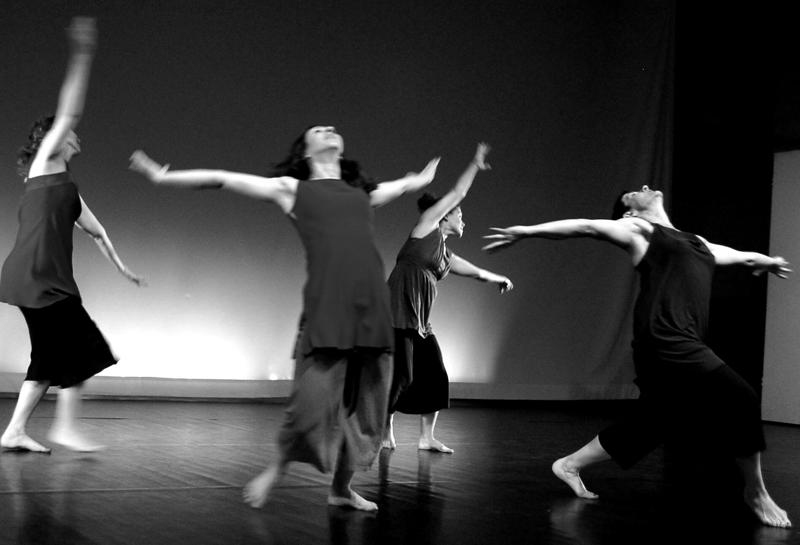 With over thirteen years of creative tradition, the Yellow Springs Community Dance Concert event will take place at the South Gym Performance Space on Antioch College Campus, in Yellow Springs, corner of Livermore and Marshall Streets. Performances are Friday and Saturday, March 25 and 26 at 8:00pm. Tickets are purchased at the door, $8 for adults and $5 for students and seniors. For more information contact Melissa Heston, 937-901-0344, melheston@gmail.com. The Yellow Springs Community Dance Concert 2011 features choreographers and dancers from the Yellow Springs community ranging from budding artists to well-seasoned professionals, and includes a myriad of dance forms from street dance, belly dance, modern dance, and jazz, among others. This year’s concert includes the following choreographers and dance groups: Tricia Gelmini, Marybeth Wolf, Valerie Blackwell-Truitt, Jill Becker, Egyptian Breeze Dance Troupe (belly dancers), Ali Thomas, Lara Bauer, Victoria Walters, Jade Turner, Greta Hill, Amanda Haisch , Jennifer Johnson, Eric Wolf, Erin Wolf, and Emma Holman-Smith, among others. Many of the works are premieres and have been created especially for this event. One of Yellow Springs professional dance artists is Tricia Gelmini. Tricia is an independent dancer, choreographer and teacher. She received an MFA in dance from Smith College and a BA in dance and psychology from Antioch College. She was an adjunct faculty in Dance at Antioch College for many years and is currently an adjunct faculty member in Dance at Earlham College. Tricia has created works for and danced in many of the Yellow Springs Community Dance Concerts, Cincinnati Contemporary Dance Theater's Choreographers Without Companies concerts and soirees, and choreographed for the Yellow Springs Kids Playhouse. For this year’s concert Tricia will premiere the work entitled, "What Words Can Not Say," with music Abbonda di Viirtu by Francesco Landini and "Tulli Tulli Traditional," performed live by vocalist, Jennifer Gilchrist and musician, Matthew Minde. Tricia often choreographs in collaboration with her dancers and this work is no exception. Jennifer Gilchrist, lyric soprano, was raised in Yellow Springs, OH. She graduated from the University of Texas at Austin with a Bachelor of Music degree in Applied Voice. She moved to Boston, MA to pursue vocal studies at the new England Conservatory of Music, where she studied with Helen Hodam, and received her Master of Music in 1988. Jennifer sang five seasons with the Boston Cecilia Chorus under the direction of Donald Teeters. She had solo opportunities with the chorus, including in Benjamin Britten's "Ceremony of Carlos," Leonard Bernstein's "Chichester Psalms," and during holiday concerts. A highlight for her was singing with the Boston Cecilia when they combined forces with two other choruses and sang Mendelssohn's "Elijah" at Boston's Symphony Hall, accompanied by the Boston Symphony Orchestra, directed by Seiji Ozawa. Since moving back to Ohio in 2005, Jennifer has performed as a soloist with the Yellow Springs Community Chorus, the Yellow Springs Chamber Orchestra, and the Bach Society of Dayton. She lives in Yellow Springs with her two children, Eliza and Miles. Matt Minde has had a hidden life of performing music when not working his day job as a graphic designer. He has studied ’cello and viola da gamba, plays guitar, mandocello and recorder, and has had the opportunity to learn and perform on crumhorn. Locally, he has performed with the Yellow Springs (Antioch) Chamber Orchestra, the Yellow Springs Community Chorus, and the Dayton Mandolin Orchestra. Growing up in a household where opera was the family business likely cemented for Matt the intimate connection between music and theater, and he spent several years producing sound design and writing music for small theater groups in Chicago. Matt first performed with a Yellow Springs improvisational dance group last Spring at the library, and learned as much as he enjoyed. He is thrilled to be contributing to this dance project. Matt lives in Yellow Springs with his wife, Jennifer, and children Joseph and Eliza. Antioch College’s South Gym Performance Space had often been home to the Yellow Springs Community Dance Concert and the closing of Antioch College represented a huge loss to the dance community not only for performance space but also much needed rehearsal space. Jerome Borchers, Chair of the Yellow Springs Center for the Arts Steering Committee, Matthew Derr former Acting President of Antioch College, Thomas Brookey, CFO of Antioch College, and YSCDC Producers Ali Thomas, Marybeth Wolf and Melissa Heston have arranged again for rental of the performing space and technical equipment for this event in the soon to be re-opened Antioch College. “We are very pleased with this arrangement and see this as one of many community/Antioch College collaborations yet to come,” said Jerome Borchers. YSCDC Producers, Ali Thomas, Melissa Heston and Marybeth Wolf want to thank current president Mark Roosevelt, former president, Matthew Derr, Thomas Brookey, and Jerome Borchers for their help and generosity in opening the South Gym Performance space once again to the Yellow Springs community dancers.